Permanent membership of the increasingly anachronistic body would offer prestige, but little else. While on a recent visit to Paris, France, Indian Prime Minister Narendra Modi, made a clear pitch for the country’s bid for a permanent seat on the United Nations Security Council (UNSC). 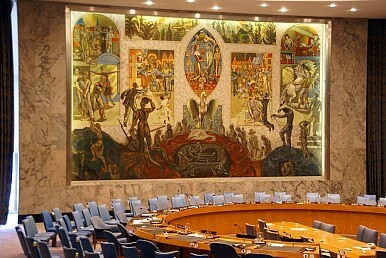 The UNSC is one of the world’s most prestigious “big boys group,” in which all permanent members (the U.S., U.K., China, Russia and France) combine the organization’s collective elitism with questionable results leading the biggest multilateral forum for peace, justice and prosperity in the world. Certainly on some levels, India’s aspiration makes sense. The country represents more than 1.2 billion people, has the economic might to back its bid, and is now relevant enough in all aspects of global politics to hold its own in the UNSC. The point of distinction here is not to question if and why India should become a member, but rather to ponder the relevance of the UNSC in today’s world. Headquartered in New York, the UN was constituted in 1945 to replace the ineffective League of Nations (1919), with the aspiration of avoiding another armed conflict on the scale of World War II. However, over the past decade and more, the UN has succumbed to the agenda-driven workings of its main financiers in the West. The past few years have shown the UN less as an organization that prevents armed conflict – its raison d’être – than as one that tries to pick up the pieces. Today, the UN is largely home to an enormous bureaucracy, a parking spot for political appointees working alongside a minority of diligent idealists who still believe in the organization’s original goals. India, however, has been a champion of almost all causes and workings of the United Nations and New Delhi has maintained an excellent commitment to the organization and its various arms. The hallmark of this is seen in the commitment that India (and other South Asian nations) have made to UN peacekeeping missions in various conflict zones around the world. One of the most common sights in the international terminal at New Delhi airport are Indian Army troops, wearing the iconic light-blue berets, heading to some foreign land to fulfill their duties as part of a UN peacekeeping force. Assembled by the UNSC, but largely manned by the likes of India, Pakistan and Bangladesh, the UN peacekeeping efforts have been critical at maintaining some sort of order in otherwise lawless and violent regions. The Indian Army has committed thousands of troops and equipment to the Democratic Republic of the Congo, Sudan and South Sudan, Golan Heights, Ivory Coast, Lebanon, and other hotspots. It has dispatched helicopters, both troop carriers and gunships. Western nations, in contrast, have committed comparatively few troops in recent years and have been notably stingy with financial assistance. Of course, South Asian countries are not participating entirely out of altruism. India takes advantage of what UN peacekeeping missions offer. The missions are a chance to bolster the combat readiness at UN expense; for Bangladesh, they are an opportunity for airmen to get some flying time. In 2013, two Indian peacekeepers died in South Sudan after Neur rebels targeting the majority ethnic Dinka community, which sought shelter at the base, attacked their UN compound. In fact, both South Sudan and Sudan are diplomatically important to India – Sudanese oil fields were the first overseas fields to receive Indian investment – and they remain an integral part of New Delhi’s diplomatic maneuvering against China in Africa. The past decade has portrayed the United Nations, and particularly the UNSC, as a quagmire of ineptness and failure, with enough conflicts festering in the world to overwhelm the entire UN ecosystem. In many cases, such as UNSC resolution 1973, which led to the NATO intervention in Libya in 2011, international action has only made the situation on the ground worse. These lapses, for example, can be held directly responsible for incidents such as the recent drowning of 700 Libyan migrants in the Mediterranean Sea. More recently, the Syrian civil war has further weakened the role of the UNSC in preventing conflicts. In 2013, the UN threw up its hands in a gesture of defeat. “Syria is our collective failure,” said UN Secretary-General Ban Ki-moon, adding that it would remain a “heavy burden” on the standing of the UN. In Syria, the UN and its various aid agencies have been more than critical in picking up the shattered pieces of the UNSC’s failures by delivering food, medicines, and other aid to a population ravaged by five years of civil war. The challenges for India in the global arena are not going to be solved with a UNSC seat. In fact, other than the symbolism of gaining veto power – itself of questionable utility – most multilateral forums around the world today have become mere events, with most breakthroughs on trade, security, and other issues relevant to India largely coming through bilateral negotiations. For example, the historic carbon emissions agreement between the U.S. and China was achieved on a bilateral level, and now will be showcased at the crucial Paris climate talks later this year. Climate change is a global undertaking, but two of the biggest contributors reached a deal on a heavily contested issue on a one-to-one level. The UNSC is a WWII holdover. Do France and the U.K. today really deserve to be on the UNSC, while Germany, the biggest economy in Europe, and Japan, the third biggest in the world, are not? The UN and UNSC have for far too long ignored economic realities and the political drift to the east, highlighted by the recent European dash to join the China-led Asian Infrastructure Investment Bank (AIIB). India has a long-standing wish to be a UNSC member, as a symbol and as a calling card of its “arrival.” But rather than chasing membership of a fancy club, India should focus its diplomatic capital on bilateral forums. Kabir Taneja is a journalist covering Indian foreign affairs and energy sector for The Sunday Guardian, The New York Times (India Ink), Tehelka, The Indian Republic and others. He is also a Scholar at The Takshashila Institution.